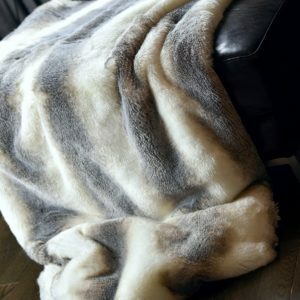 Create a warm and inviting space by adding a glamorous faux fur accent to your home with this guilt free throw blanket by Eikei. The irresistibly soft and thick premium quality medium length pile will provide warmth and coziness while adding a touch of luxury. 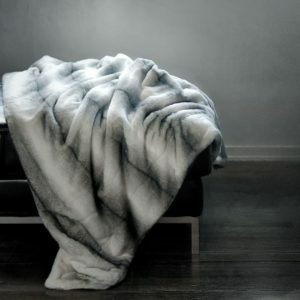 Medium weight blanket that is not too light nor too heavy, does not shed and reverses to buttery soft plush velvet for two unique looks. Conveniently machine washable and air dry-able for easy care. 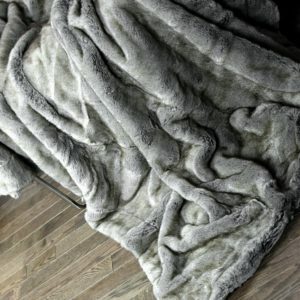 To preserve the ultra soft feel of this throw: Please do NOT tumble dry or use fabric softeners/sheets as they might strip the luster and cause matting of this fabulous faux fur texture. 100% Acrylic front with minky soft velvet microfiber reverse. Comes with a storage bag and a festive ribbon ready for Holiday Gifting. Coordinates with faux fur throw and Euro size pillow covers by Eikei Home.